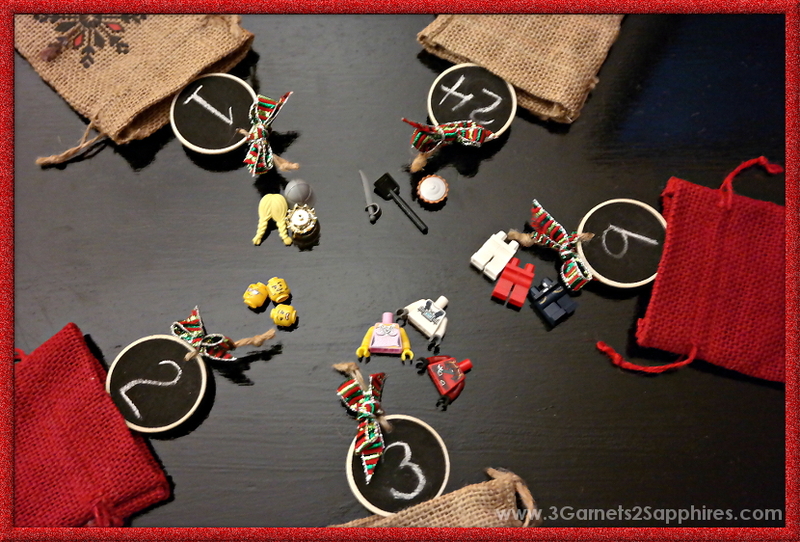 I first made our own reusable, refillable advent calendars four years ago. We've gone from using these paper mache boxes to these more durable burlap drawstring pouches last year. The pouches with the hanging chalkboard clips worked out well, so we're using them again this year. One thing that we are changing this year is what goodies the children will find in the pouches each day. 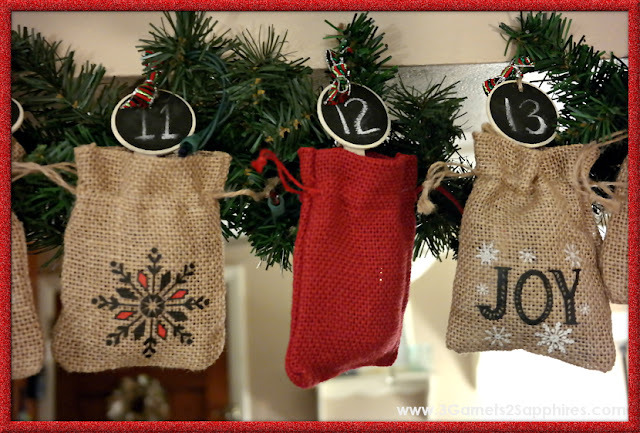 Our DIY advent calendars usually have one piece of candy for each child plus something fun. For the past four years, we've put jigsaw puzzle pieces in the advent calendars to add a fun, quick activity to each day. As the children grew older, we increased the difficulty of the puzzles. Last year, we used a puzzle that was several hundred pieces. It took my husband and I hours to put the puzzle together so that we could put the pieces in the pouches in a logical order. Also, there were so many pieces, that the advent pouches were stuffed full, leaving very little room for candy. After thinking about a possible solution for quite awhile, I decided to try something new . . . using loose LEGO Minifigures! 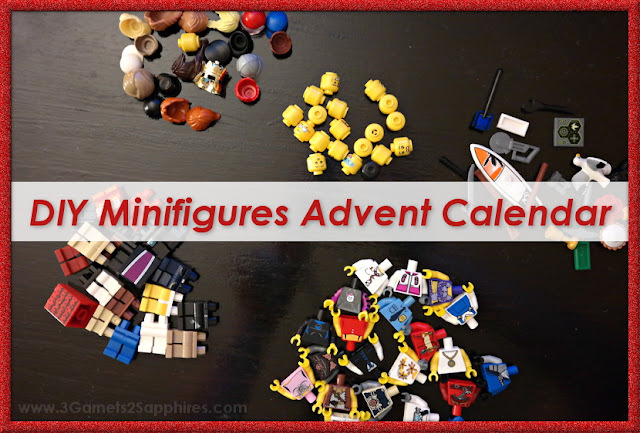 To keep the cost down, I decided to put one minifigure part for each child per day rather than a whole minifigure. This also adds an aspect of fun because the children can see what parts they have at the end of the 24 days and trade with each other. For example, on Day 1 there will be 3 minifigure heads, on Day 2 there will be 3 minifigure hats or hair, and so forth. After the 5th day, they will each have enough parts to make one complete minifigure. After 20 days, each child will have enough parts for four complete figures. Day 24 will have extra parts and candy in it. You can find minifigures at your local LEGO Store for 3 complete figures (head, hair or hat, torso, legs, and accessory) for $9.99. I purchased mine from this ebay seller and was extremely pleased. All the figures I received were genuine LEGO (not knock-offs) and included a good mix of figures for both boys and girls (no duplicates). You can also find loose LEGO Minifigures on Amazon for a decent price. Just be wary of prices that look too good to be true, because those might not be genuine LEGO figures. I probably will need to think of something new to go in next year's advent calendar to surprise the children. Have any good ideas? Share your ideas with us in a comment on Facebook!